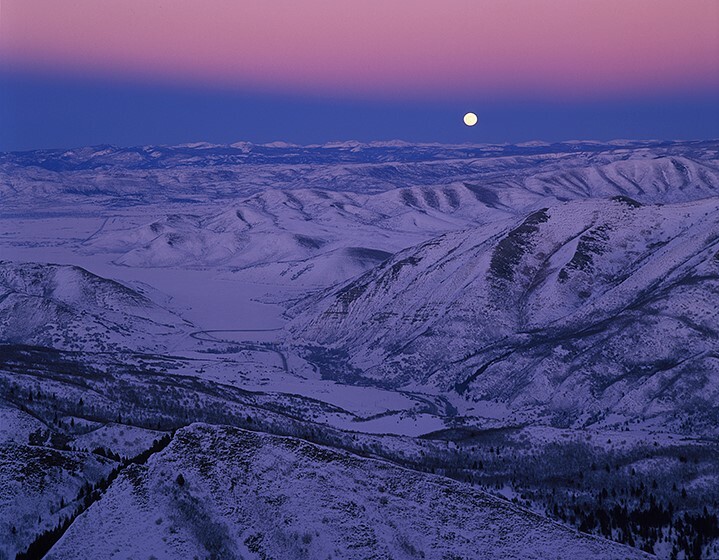 Sundance #39: Except for the horrible smog over the city of Provo, created by a cold weather inversion in the Great Salt Lake Basin, our perch in Bearclaw Cabin at the summit of the Sundance resort ski area, looks out over a very cold, clear night that promises a full moon rise. Since I will need to make extremely long exposures as the evening wears on, I am grateful that it is not windy. The terrace around the hut is well-packed down from use by all the skiers, so I have a fantastic platform with a 360˙ perspective that becomes expansive to the north and east, looking out over the Deer Creek Reservoir and the Heber Valley. Inside, the hut is warm, the food is good, and in spite of the smog to the west, elsewhere from our lofty POV, the end of the day presents a great sunset show for our after-dinner cocktails, so we grab sling-chairs, and take up positions on the ridge to watch the coming of night, and the arrival of the moon. Sundance #38: Having just taken you through some of the lowest lying terrain in my residency area, Provo River canyon, it seems appropriate to visit the other extreme as well, the top of the ski lift at Sundance. Previously in this blog, post #5, I show you people gathered at the summit hut, eating, and sitting in the sun. Named Bearclaw Cabin, the hut is relatively small, but contains a kitchen, service area, and tables/chairs for 30-50 people, the rest spills over to the outside. It is closed down at night, but with the blessing of the resort, I work with a friend on the ski patrol, and arrange to camp in the hut, overnight during a full moonrise. We pre-prep food to take up so we minimize the cooking, then all we need are sleeping bags, floor pads, and my camera gear. We take the last lift run up for the day, and watch everyone slowly disappear downslope, as we offload our supplies. 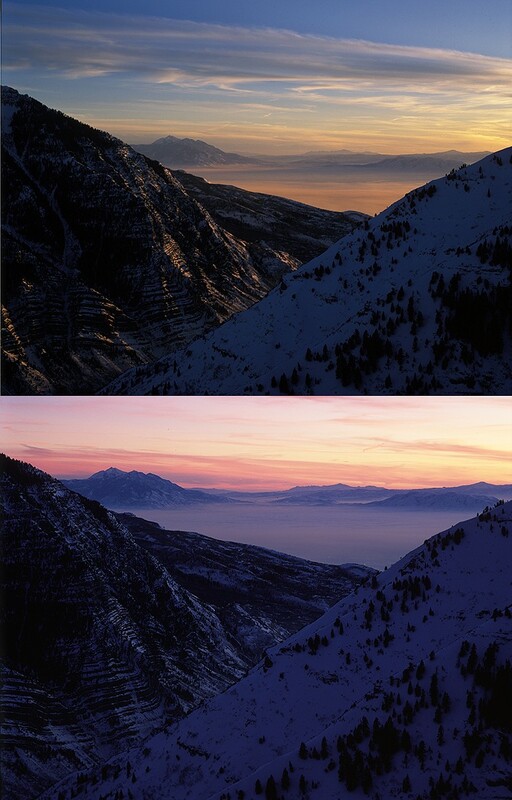 It has been a very cold day and in the Great Salt Lake Basin, an inversion layer has trapped stifling air pollution on the ground, blanketing to invisibility both Salt Lake and Provo. This view from Bearclaw Cabin at Sundance looks out of the mouth of Provo Canyon, directly at the city of Provo, normally twinkling with thousands of urban lights. That is NOT a fog, THAT is smog! Fortunately for our lungs, that is trapped well below us for this evening, and very little of it has intruded into the canyon. Sundance #37: My morning in the cold depths of the Provo River canyon, rewards me with several images (the last two posts) that become an important part of my portfolio, and print sales. As it turns out, my residency at Sundance has begun some years after my first visits to China, and at the guild where I am translating my images into textiles, I always present new work I think might excite their interests. The embroiderers I work with appreciate that I have an unusual take on how they might consider rendering an image, and they are fully on-board when I present the last post as a subject. Rather than just embroidering the entire picture, I want them to do this as a double-sided piece, leaving the water and the background with stitching “thin” enough to provide transparency. Then, elaborate on the stitching that defines the trees and ice. My colleague, and collaborator, Zhang Mei-Fang, also assures me that they will “pay special attention” to the illusion of steam rising from the water. The above is the finished product. The embroidery is about 16”x 20”. Because of the way it has been sewn, when brightly illuminated from behind, the reflective snow is blindingly white, the ice crystals in the trees truly look as thought they have sunlight radiating though them, and the steam IS rising off of the river. The display stand is mahogany, carved with a phoenix motif, and the image can be rotated 360˙. I want to thank Robert Redford for inviting me to Sundance, because the work I created there carried well beyond my residency. I am also happy to say this embroidery, “River Scene in Winter,” is in the collection of Michelle Lund of Newport Beach, CA. Sundance #36: Moving quickly from one location to another in Provo Canyon, trying to take advantage of the unusual conditions, I find this POV in walking distance from a parking plow-out on the highway. Apparently a lot of people come here to access the river for fishing, and if you look carefully, you can see footprints on the right shore, from someone fishing along it. I am still in a pocket of extreme cold as well, so even tough there is full sunlight, the ice crystal melt-out of the bushes and branches has not yet occurred. Best of all, I am legally parked, so I can sit here and take this in. Looking back at this moment, I realize my mantra of “seize the day and go out to shoot, regardless of the weather,” played out many times in my career. What is most striking, some of the worst days, produced some of the best shoots. Many times in the terrible conditions, going out, and staying out all day, produced not one, but several images important to my career. 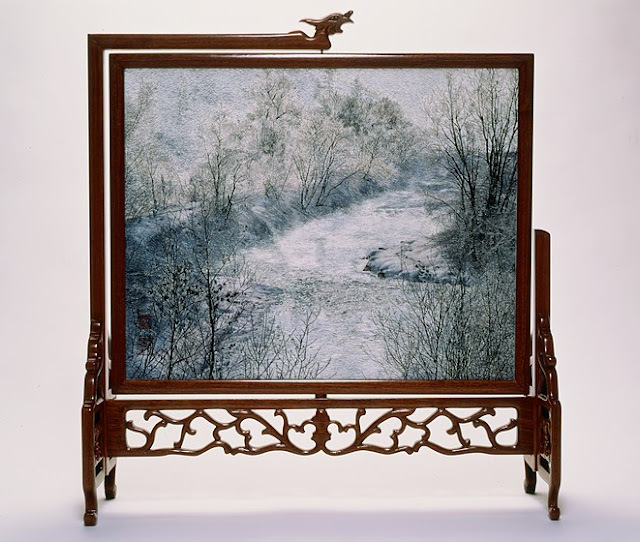 This, and the previous post, became two of my best selling prints, and this image was selected for embroidery when I was collaborating with an embroidery guild in Suzhou, China. I will show you that embroidery next week, and you can learn more about my 35yrs. of collaborative work in China, here. Sundance #35: The Provo Canyon highway is snow-embanked, with only a few plowed turnouts, but I am fortunate that there are no other cars as yet this morning, so I occasionally stop, turn on my blinkers, and climb the snowplow mound, to see what I can see. Because the river meanders, changing the angle on the rising sun, some sunny areas are already frost-free, having melted out in the first rays of warmth. Then I arrive here. Lots of sun. Everything is still frost covered, AND I am at a low point in the snow wall, with little brush near the highway that might obscure the view. This is a great POV, but it is some kind of cold pocket as well, and while I work for this shot, the temp drops to -20˙ I am wearing two pair of gloves and my fingertips are still numb. Probably the only reason that my Pentax 6x7 is still working is that the heater in the car, warms it. Sundance #34: As my workshop students know, one of my caveats is that there is no such thing as a bad day. Regardless of conditions, if you plan to go out and shoot, do so, regardless. I would be first to admit, I was not especially excited to wake and find the morning at Sundance to be sub-zero. Good time to have a long, slow breakfast in the Tree Room,..or not. I did the “or not,” and drove down into Provo Canyon, where it is even colder. 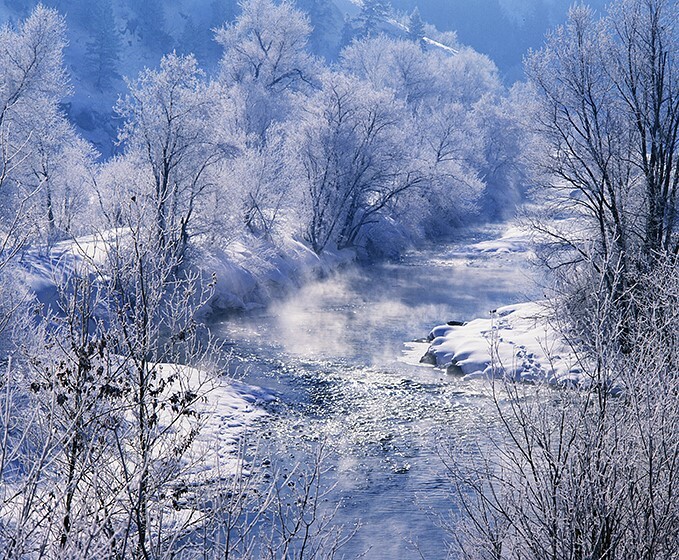 My reward is that the air is SO cold, the river is steaming, and the vapor is attaching as ice crystals to all the trees and shrubs onto which it drifts. It is an amazing spectacle, and I struggle to know where to be. As the rising sun begins to light up the canyon, it is also melting the ice frosting. Because I am still in a lot of shadow, I feel I should move to sunnier locations before they melt away. Sundance #33: On this sub-zero morning, it seems no one is out yet on the highway that traverses the Provo River canyon, between Provo and Heber City. After driving down from the Sundance/North Fork basin, several thousand feet above, I am immersed in the -8˙ air that has sunk to the lowest point, hovering above the river. 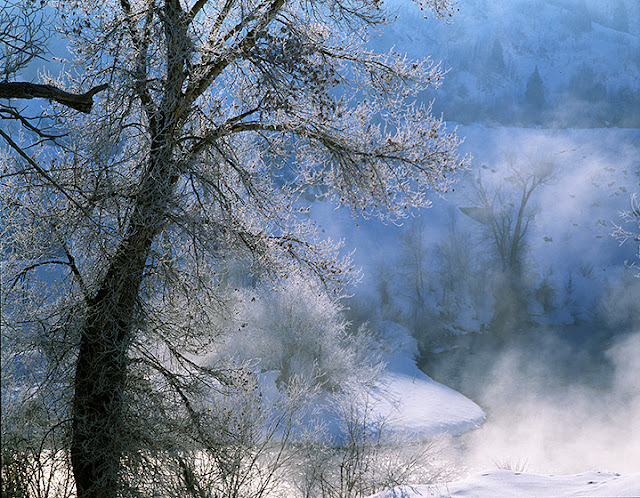 As the river water is warmer, it is steaming, and the steam is frosting some things, as you see in the last post. I arose at dawn for this drive-about, so there was no sunlight, when I first entered the river canyon, just deep, freezing cold shade. Driving along the highway to the north, changes all of that. It does not get any warmer, but the sunrise finally reaches the river, and it does get a lot “trippier.” This is the “for real” Crystal Blue Persuasion, not the same as what Tommy James was singing about, but WAY better. Follow the next few posts of this morning’s adventure to see some remarkable, and very fleeting moments on planet Earth. 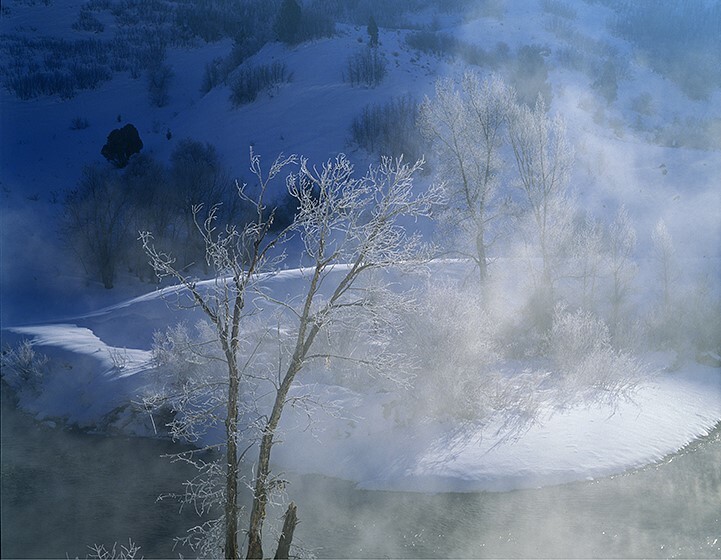 Sundance #32: Below 0˙ all night, but flowing rapidly enough to keep a lot of open water, the Provo River water is warmer than the -8˙ air above it now, so it has been, and is now, steaming. The steam rises on the slightest wind current, and ultimately turns to ice crystals floating in the air. 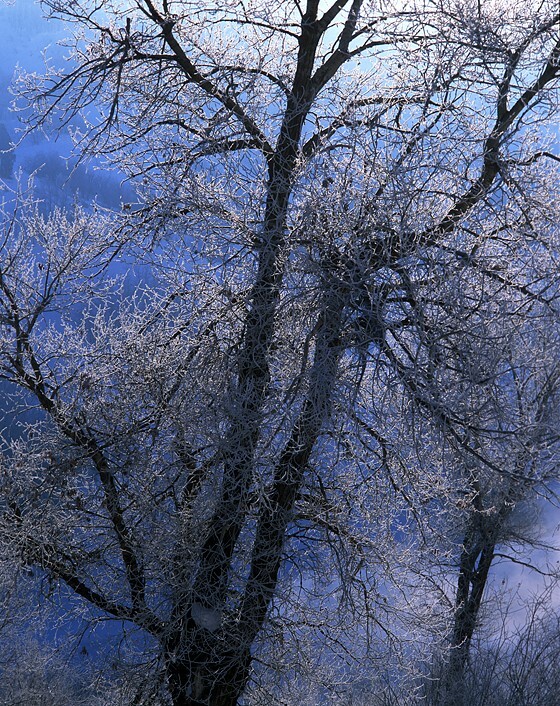 However, if the rising water vapor touches something cold, such as the branches of trees, it freezes immediately, encrusting the twigs. This can be a very subtle process, as some areas of the tree may remain “warmer,” and thus, no crystals materialize. I work with this for several shots, but my camera is having vapor-on-the-lens problems, and the frozen air particles I breathe into my lungs burn, so I return to my SUV, and begin a drive toward Heber City, following the sinews and bends of the Provo River. Sundance #31: In the previous post, you see a fog over the low valley of the Deer Creek Reservoir. It has been created because the air is SO cold, it literally freezes, and the crystals cause the haze. This condition occurs frequently, when it is cold AND CLEAR, and the temperature falls into the teens or below. 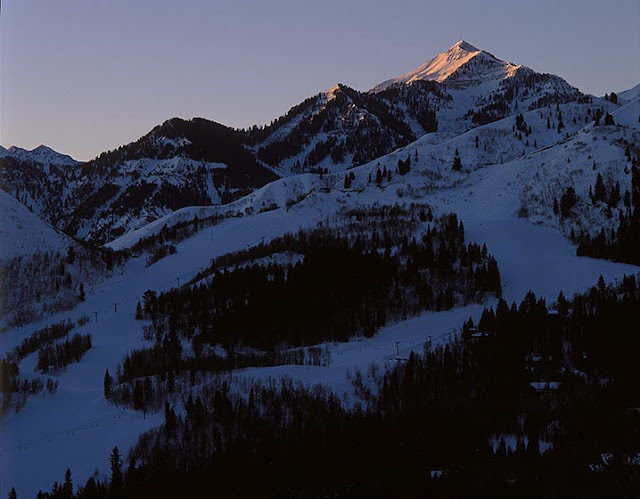 It starts with a dawn like the one above over Sundance resort. The sky is “bluebird.” The temperature has been falling all night, and at the resort this morning, it is about 10˙. Cold air sinks, however, and Sundance sits in a high basin, beneath Mt. Timpanogos. Provo Canyon is well below us, and interestingly, it is MUCH colder down there. That is where the coldest air has settled. As I drive the relatively steep North Fork Road, slowly down into the Provo River canyon, the outside temperature plummets, and I enter a zone of haze-frost briefly. 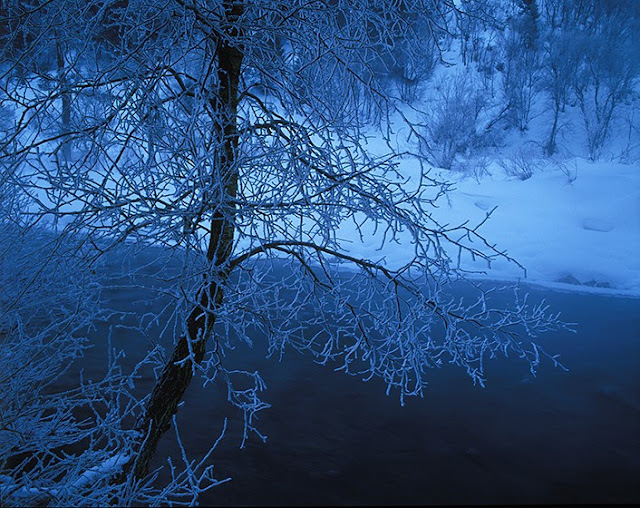 Then, I pass beneath it, into a VERY different world of predawn, super-cold (-8˙) blue shade. Where my road meets the canyon highway, I also come immediately to the banks of the Provo River, which the highway parallels. The presence of the river makes for a whole new environment, I need to immediately stop and consider. 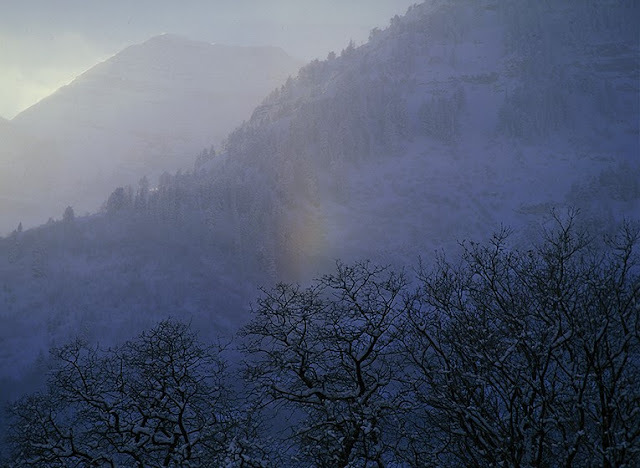 Sundance #30: There is another kind of haze created at Sundance and around the Provo Canyon and Heber Valley, but it does not occur because of wind-whipped snow crystals floating in the air. Quite to the contrary, it is created by just the opposite condition, dead-calm, and super-cold. 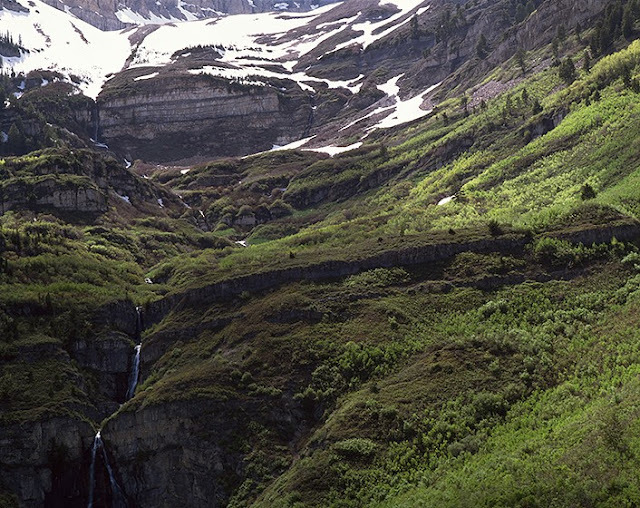 Because Provo Canyon is deep, narrow, and flowing with water, it generates very cold air laden with moisture. The water vapor literally freezes, creating an ice-fog. Unlike the blowing snow (previous posts), this haze does not occur on the ridges and summits, it sinks to whatever the lowest point is, which includes the canyon and the surface of the frozen-over Deer Creek reservoir.The image above is taken from a turnout above the reservoir, over which the Timpanogos ( mt. timpanogos temple ) summit towers. It is just before dawn, and you can see the sky about the mountain is clear, and blue-sky. This is a winter condition skiers refer to as clear-and-cold, meaning REALLY cold, perhaps even sub-zero. When you look at the bottom half of this frame, however, it is not clear, because a ground-level, ice-fog has been created by the freezing conditions. Sundance #29: With the sun now almost entirely gone, North Fork Canyon is blustery, dark, and COLD, but the amazing display of light on Mt. Timpanogos is too interesting to abandon. I walk up the road a bit from where I made the previous profile shot (last post), and I am now completely in the shadow of the east face. 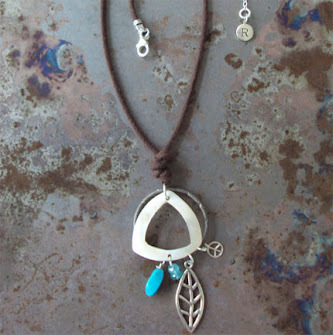 It is a blue world, with a gentle haze of crystals floating everywhere. Then, as the very last light of the setting sun crowns the summit ridge, I decide to photograph the shadow of the mountain, not the light show. From my POV, there is no dramatic composition, just a rugged face barely discernable in the impending darkness. My camera meter is telling me I must make a multi-second exposure, and for the moment I can do so because the winds have abated slightly. While I can see the subtle illumination left on the western ridge, I did not think it will record, because it is barely visible. Nonetheless, the magic of “trying,” wins the day, and the above is the result. Now, the sun is gone, I am freezing, and I intend to have a huge dinner in the warmth of the Tree Room, to make up for being out all day is some very sketchy weather. Sundance #28: The howling windstorm of the last two days, has made skiing conditions less than desirable, so most of the “day-trippers” who came to ski Sundance, have gone home. Because I am staying at the resort, I am not faced with a treacherous drive out, so I linger as the sun sets and watch the glow-show swirling around Mt. Timpanogos. 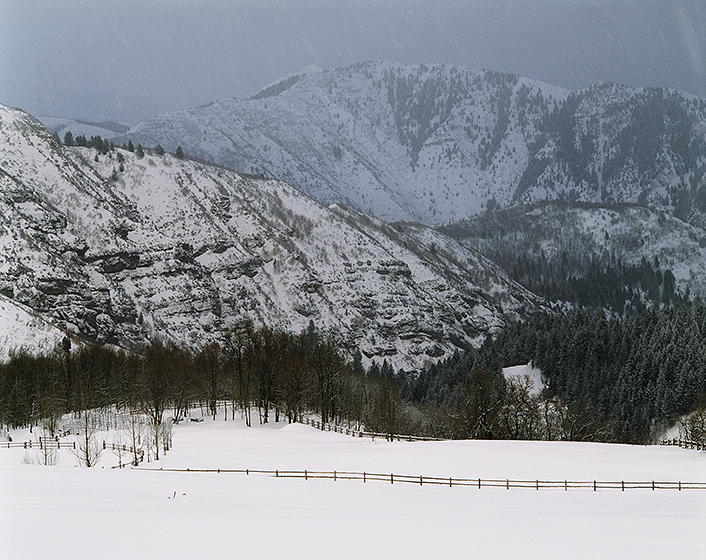 North Fork Canyon, where the resort is located, has now slipped into the shadow of the summit, and is growing ever darker. 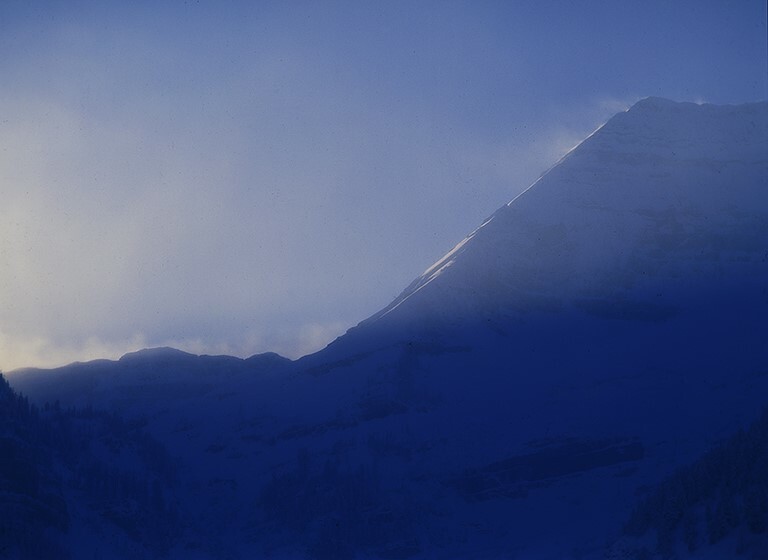 One of the summit faces, however, looks due west, and consequently, the towering ridgeline and all of the snow banners blowing off of it, are backlit and luminous. It is an astounding “profile” moment. Sundance #27: Just before the sun goes down, it seems the wind picks up. You can hear it howling across the summits and faces of Mt. 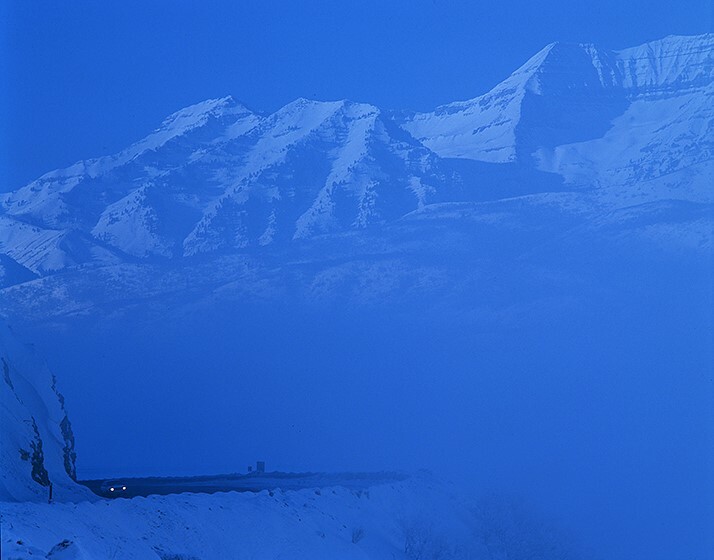 Timpanogos, and the snow banner from the top is blowing off a dense fog of ice crystals into the North Fork basin. It quickly covers me, while I am trying to work, and it is irritating to breath in, as well. It is also an irresistible light show. The increasing wind during the setting sun sets off a massive glowing cloud above the canyon, that then settles like snowfall. It is NOT snow, however, but primarily ice, and it makes road conditions really sketchy. It is on days like this I am grateful I can stay at Sundance, rather than drive down the now-treacherous canyon road, and back to Provo, which so many skiers do at the end of their day. No one wants to do that in the dark, so most have gone home by now and they missed this. Sundance #26: With little else to do, I enjoy a late lunch at a country cafe in Heber City and by the time I return to Sundance, the winter sun has slipped behind Timpanogos, and North Fork Canyon is now in evening shade. 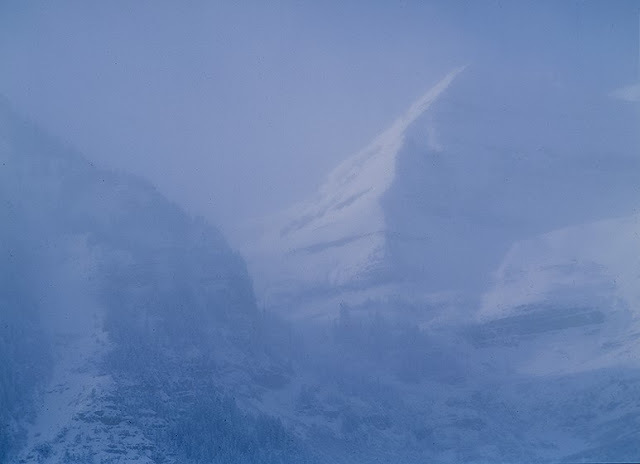 As has been usual throughout this storm, “Timp" has high-wind snow banners screaming off the summit, making it a spectacle. As I drive further up the canyon, the shade deepens and the temperature drops, but the air, choked with blowing ice crystals, has become prismatic. Not exactly brilliant like a rainbow, but anytime I look toward the sun illumination of the summit, the direct light refracts colors in a kind tonal fog. This shimmer also constantly shifts as the gusts swirl the crystals about. It is an amazing thing to watch, and I actually wish I could have recorded the motion. I also discover the the rainbow aura is only visible in the deep shade of the upper canyon. Descending the road into the next, brighter basin, it disappears. I suspect it is so faint, it needs the darker wall behind it to make it visible. Sundance #25: In the morning (previous post), the howling wind of the night before continues, and between wind-chill exposure, and snow crystals all over my gear, I retreat to my car and decide drive around, hoping to get out of the high-altitude bluster. Headed for lower elevations, I descend North Fork into Provo Canyon, and then turn north toward the Deer Creek Reservoir and Heber City, thinking I will find some relief there, or further out into the farmlands. The road is covered with ice crystals, and it is blowing as hard at ground level around the reservoir, as it was a Sundance. Heber City is like a ghost town, as everyone has taken cover, and when I drive further out, into more open terrain, I encounter ground-blizzards of blowing snow and ice. There is little visibility, and it seems to be getting worse, so I decide to return to the resort. Pulling into a farm driveway, to turn around, this appeared as a snowy-icy gust flew by. Farm dogs are tough, but this one is clearly not happy. 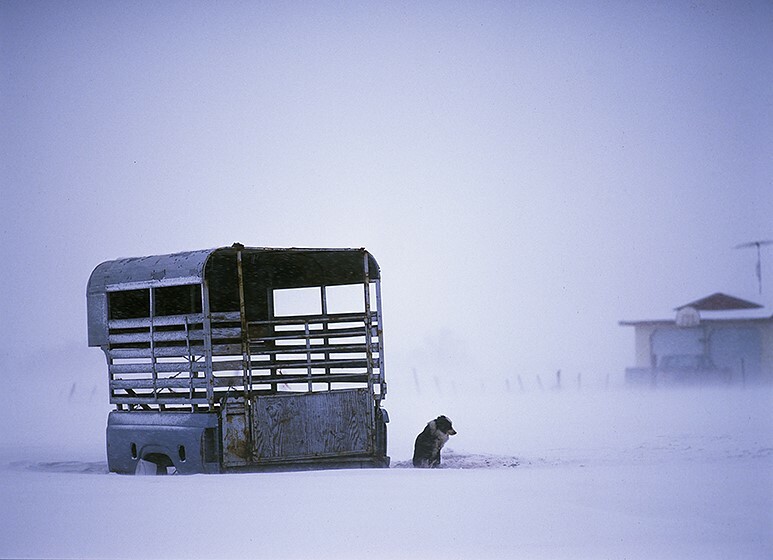 Sundance #24: The raging windstorm (last post) continues through the night. It is every ski resort’s worst nightmare. You get a nice, fresh powder snowfall, that is literally blown away by the winds that push the storm east. Those winds have not yet gone away, either. Next morning, this view up a cirque shows a screaming snow banner carried in a horizontal tornado of wind, churning through a saddle between two summits. I am using my SUV for protection so that I do not have camera shake from the fierce gusting, and I am thousands of feet below that pass. It must be stunningly fierce up there. Note that the dry brush in the landscape has reappeared. For a few hours, it was smothered by the snowfall, and all was white, then,..this happened. Sundance #23: Another challenge of the Sundance commission I impose upon myself, is repeatedly confronting the dominant feature of the entire North Fork/Sundance Basin, Mt. Timpanogos. It makes the setting of Sundance what it is. It is so dominant, moving around in the basin does not change your view very much. So, for me the visual aspects I am exploring are the evolution of change on a subject that remains in relatively the same position. In post #8, I point out that storms from the west, slam into the summit, sometimes as deep, dry snowfalls, and sometimes as raging windstorms, or in this case, both. 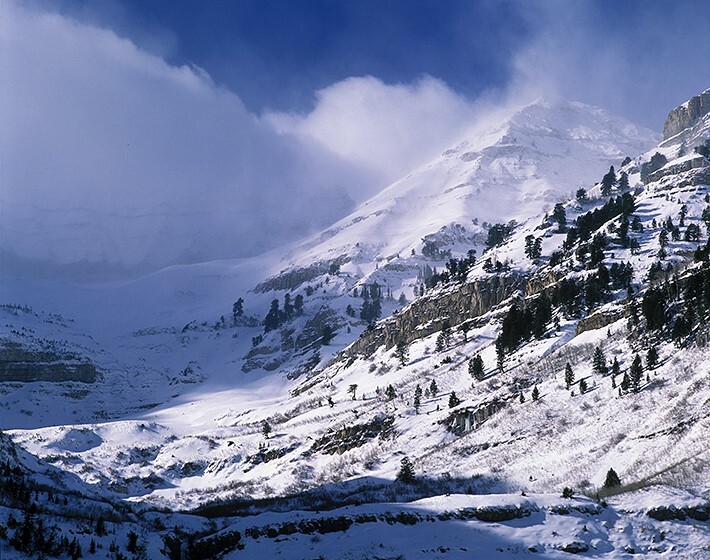 The Sundance basin is located on the east side of the summit, at the foot of one of Timp's most spectacular faces, and on days when it is howling, being below that face, looking up at it, is quite a show. This morning started with an unskiable snowstorm, blowing hard enough to create closures due to avalanche conditions. All day long, I am pounded by blowing snow and crystal. 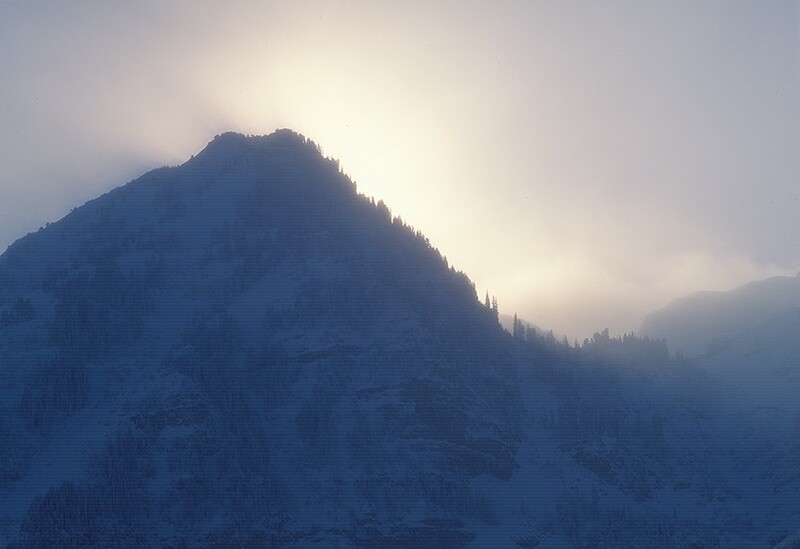 Much of the day is too dark and hazy to get anything done, but in the late afternoon, thinning clouds to the west, let through some low rays of sunlight, and Timpanogos becomes a white, glowing apparition above the resort. Sundance #22: In my earliest portfolios, “WINTERS: 1970-1980” and ORDER FROM CHAOS, my concerns were exclusively visual and painterly. The images in those two portfolios are about how the frame of the picture fills with shape, color, and texture. The location of the landscape is inconsequential, and titles tell you nothing about “place.” In subsequent projects, all of which became books, The Hudson River and the Highlands, The Tongass: Alaska’s Vanishing Rainforest, and Overlooked in America: The Success and Failure of Federal Land Management, the pictures were very much ABOUT “place.” The photographs in those publications were intentionally created to be broadly descriptive, and to make purposeful statements to the public through them. Now, working here in Sundance, Redford has indicated to me that this is a chance to be creative, be free of those concerns, and just enjoy this unique location. As with all landscapes you first experience, you inevitably see and make “beauty” shots, but if you keep working over time with the same subjects at different moments, your insight to them is refined. Certainly this “brushyness” I am experiencing in the high desert, Utah winter (last 3 posts) becomes one of those visual explorations. 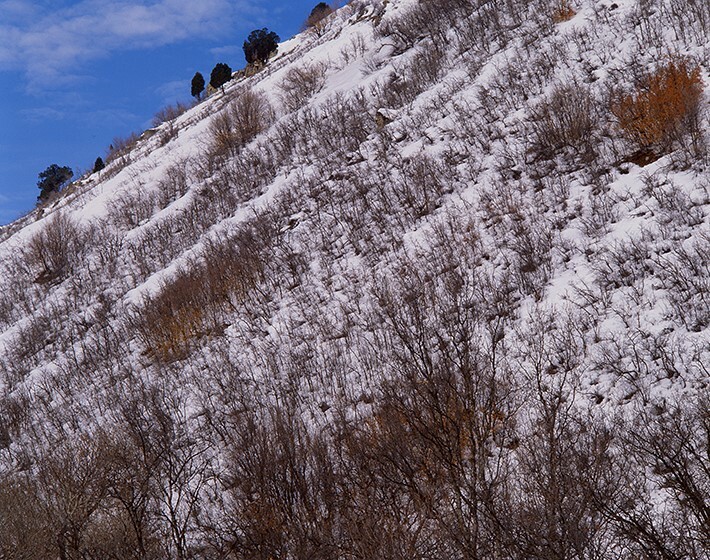 Sundance #21: In this image, the vertical landscape intersects with an unusual color field. I describe these subtle tones of the barren bushes as “linear haze.” What I see is created by thousands of twigs, and the color is more like a cloud, than a clearly defined thing. I also find the framing and the steep angle really interesting, but best of all, it is SUCH a picture of nothing. It does not aspire to be beautiful, or descriptive of anything. It has no complex compositional trickery. It is just a slope of denuded brush. Personally.., a PERFECT slope of denuded brush. For a sense of scale here, the trees in the distance are huge, the tonal bushes are overhead, and the branches in the foreground are the tops of big trees alongside a small dirt road. Sundance #20: The spare winter of my first Sundance visit provides some very graphic subject matter in the surrounding landscape, and it also leaves many of the high mountain dirt roads accessible, so it I venture where I can. One of the beauties of having access in the vertical environment around Sundance is that it offers many dramatic overviews and perspectives. On a day that has a lot of passing weather, but just cannot seem to snow, I am driving a backcountry road, and I stop for awhile to watch the dappled sunlight slowly creep across the landscape of brush covered hills. I will learn to do this more and more as my residency plays out. The effects of the lighting across the many different parts of this landscape can completely blow things up, or, in this case, cloak them with a subtle glow and color tone that is barely there at all. Sitting to watch the show unfold is a requirement of this new work. Sundance #19: I am getting ahead of myself, however, with the last few posts of seasonal colors. If I gave you my 3yrs. of fall, and fall helicopter work, all at once, it would be too much to digest, so I will parcel it out. I return to my first winter visit, which is quite spare of snow for some of the weeks I spend there. I have been told whether I take pictures or not, and what they might be of, is entirely up to me. Redford says he just wants me to have some time for my creativity to be recharged after the environmental campaign work I have been doing. The very vertical environment of Sundance allows me to use the spectacular weather lighting, stunning fall colors, and graphic forests, to pursue my purely visual interests in color, and complex, intricate detail, creating layered compositions within the picture frame. The first spare winter visit provides some great opportunities. Sundance #18: Higher above the Heber Valley floor the glow of fall color rages randomly up the hillsides, where it encounters more evergreen trees, adding yet another layer, a foil to the brilliance, into the fall mix. On a good day, I also experience fleeting holes of sunlight that pierce the cloud layers, and on occasion, flit across the landscape in such dramatically illuminating waves, it is hard to believe it isn’t choreographed. During some of my more weather-ladened shoots, I find myself on ridges, connected by narrow fire roads and a view like the one above. Standing here for quite some time, I could easily make dozens of images, as that spotlight on the far hillside is just one of many that swim over these mountains and valleys, lighting select trees, groves, and sometimes, just one entire mountain, but nothing else. I spend a lot of time trying to anticipate and record the “best” moment, whatever that means, when there are SO many! Sundance #17: Rain and the overcast bring out saturated colors of the fall foliage, and Sundance sees plenty of weather, so it rains frequently and offers me some amazing images. This is a rural road with great views of Timpanogos in the distance. At the moment, however, Timp is NOT the show as fall is upon us, and the rain is causing all the vegetation to glow, and it is not just a few trees. The bushes change color. The desert grasses do, as well. Everybody gets into the act. 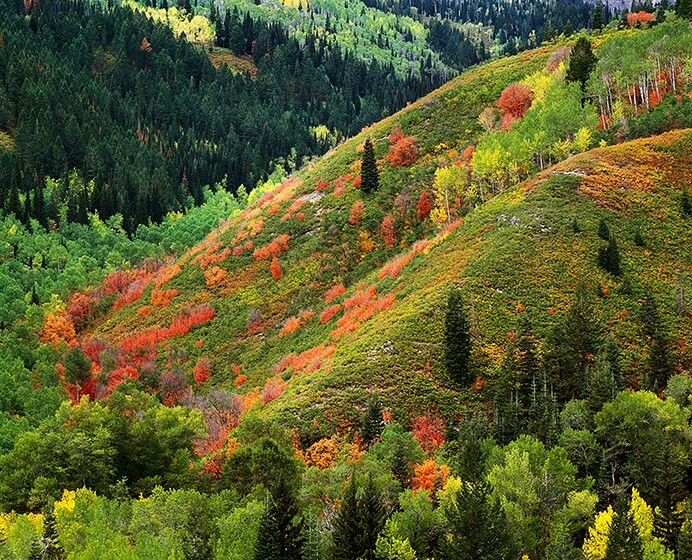 As the season intensifies and peaks, the hillsides of the eastern Wasatch scream out with startling puffs of color that go clear to the summits, and the lower slopes are decorated with dense groves of trees, that not only are intermixed species competing for space and nutrients, but they also seem to be having a flamboyant color display of one-ups-manship. Sundance #16: Same place as previous post, but now looking quite different as each of the bushes, plants, and trees goes off with their own shade of fall color. 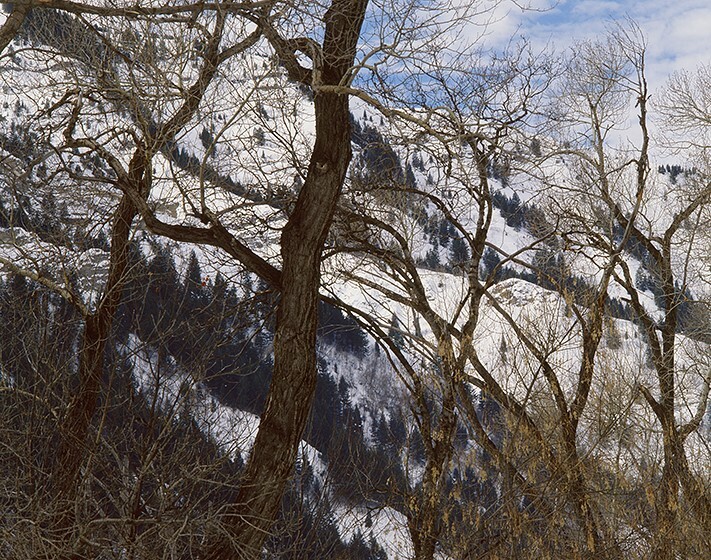 In the course of my Sundance residency, I drove around the Wasatch Range frequently. 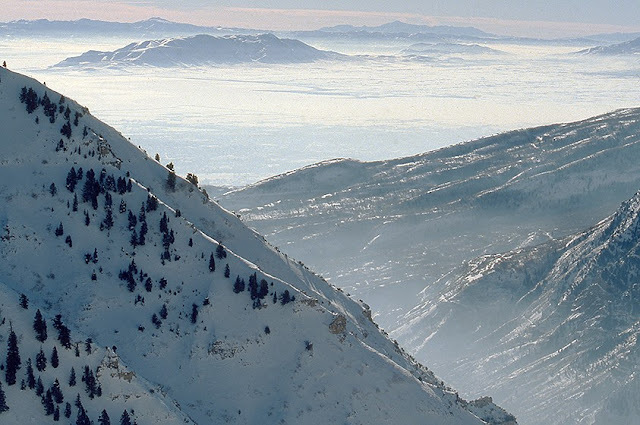 The Salt Lake City side of the range hosts some very famous ski areas, all to be found up steep narrow canyons. 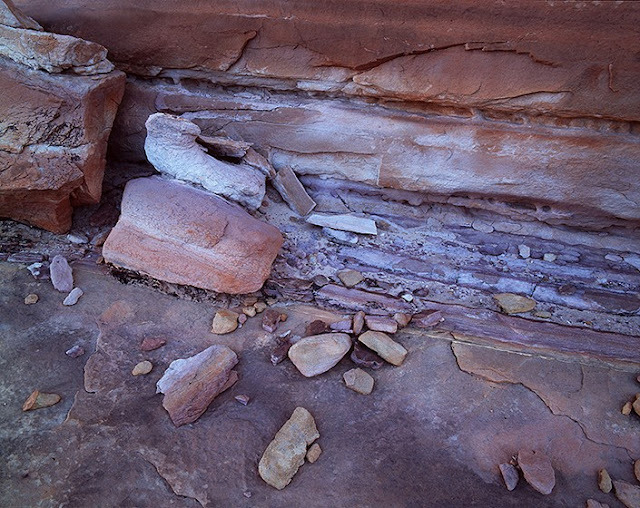 While those canyons also display fall colors, the display is not as diverse, as what happens on the east side. 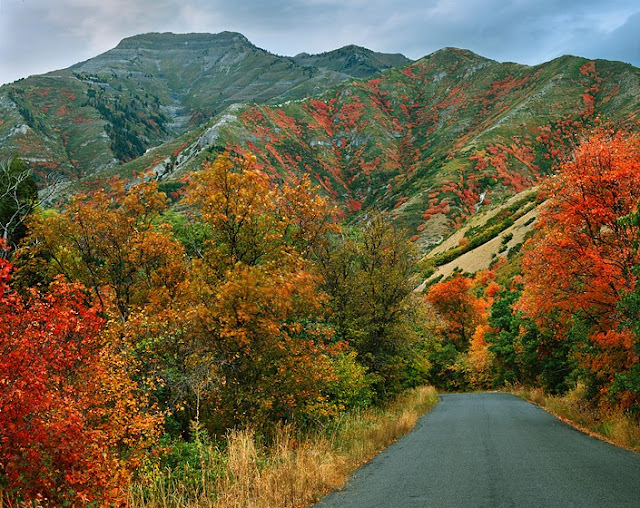 The hills above Provo are a clue to the resplendent diversity of fall color you experience once you begin driving into Provo Canyon. 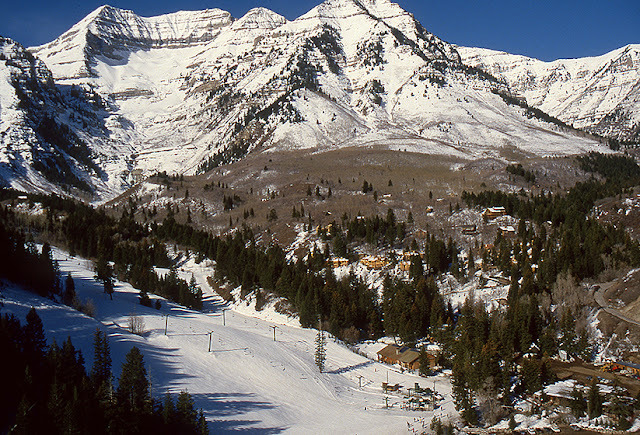 Sundance and Mount Timpanogos mark the southern end of this, but as you drive north from there, around the Provo reservoir, and through Heber City, you eventually come to the resorts of Deer Valley and Park City, which have been developed at the northeast end of the Wasatch. All of this east side terrain experiences a startling fall display. As you can see here, it goes off in pockets and waves. The aspens are just now starting to turn in this image. 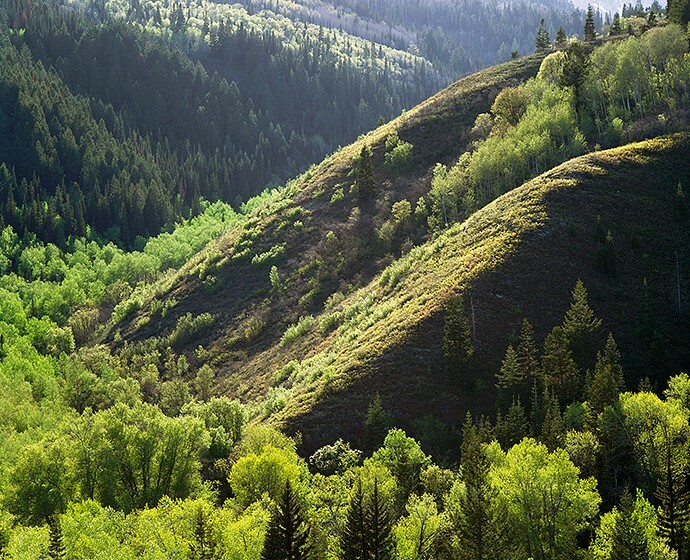 Sundance #15: The last two posts, and this, show of the verdant greens of spring and summer. The first growth in the aspen groves glows with an emerald radiance that is every bit the equal of the golden colors of fall. As you see here, the mix of trees also punches up the color as the darker evergreens act as foils to the luminous, deciduous groves. I return to this view many times, as it proves to be a POV where there is much to learn. At the moment, besides the aspen and the evergreens, there is other vegetation in small clusters, growing on the rolling hillside, and the hillside, itself, hosts a dense ground cover of mixed species. You can see it all at this moment, because each of these elements has a different texture, but it takes awhile to sort it because EVERYTHING is green. Now, if each of these varied elements in this landscape were of wildly different colors, wouldn’t that be something to see? Sundance #14: Being 11,752ft. 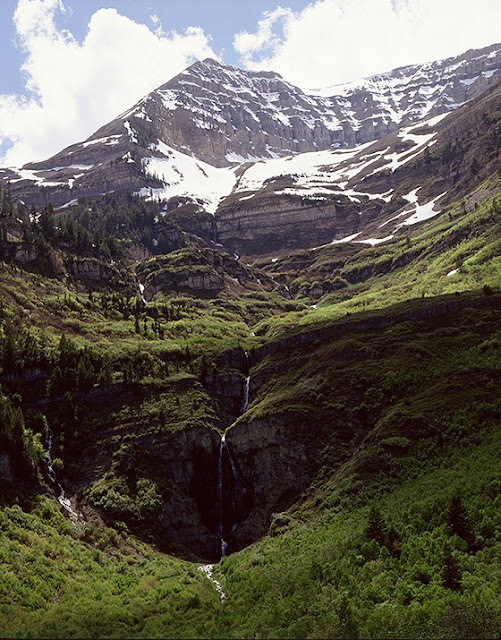 is only part of the drama of Mount Timpanogos. It is VERY broad, as well, and driving around it, is like encircling a small mountain range, but it is just one large massif. Scale is difficult to judge with little reference, but perhaps this “detail” from the post last week will help. A hiking trail cuts a small line into ridge of the hill in the foreground, right, but you cannot follow it any great length because it disappears back into trees. Those trees are an entire grove of large aspen. A hiker on the trail would barely be visible. In the basin, above the ledge of the waterfall, flower-filled meadows and extensive groves of trees, make for some spectacular seasonal day hikes and picnics. 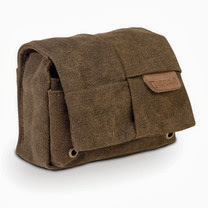 Handily, nice picnic lunch baskets can be prepared for guests at the Sundance general store. If you stay in the Sundance guest cottages, this is an amazing thing to have in your backyard. 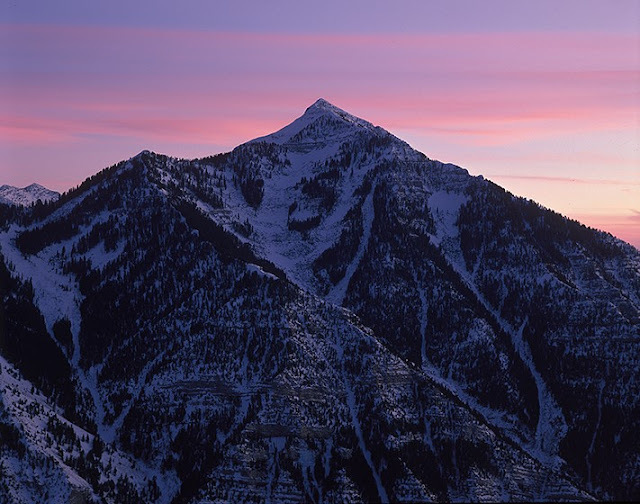 Sundance #13: As in the winter, the real “show” at Sundance is the setting, literally at the foot of 11,752ft., Mount Timpanogos. 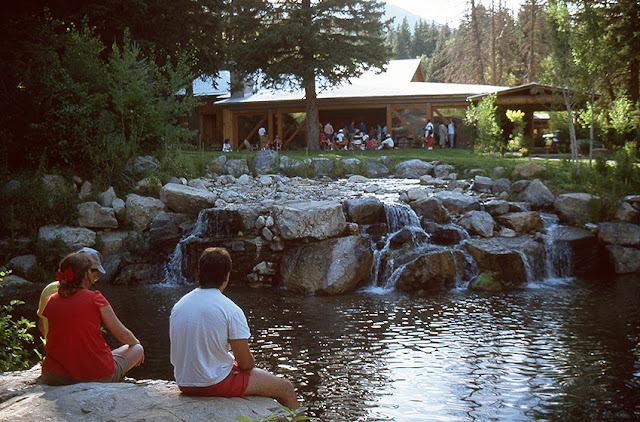 The water you see here, flows through the Sundance property, and hikers often begin from Sundance to ascend into these meadows. Although the summit trailhead is further up the road, past the Sundance resort, the meadows here are extravagantly lush, there are many waterfalls and pools, and there is much less traffic - “Timp” is one of the most climbed summits in all of the Rocky Mountains, so there are always people on that trail. As the summer comes, the snow retreats, and the green slowly climbs up the walls. When fall arrives, as you will see, a spectacle of color comes down the walls. 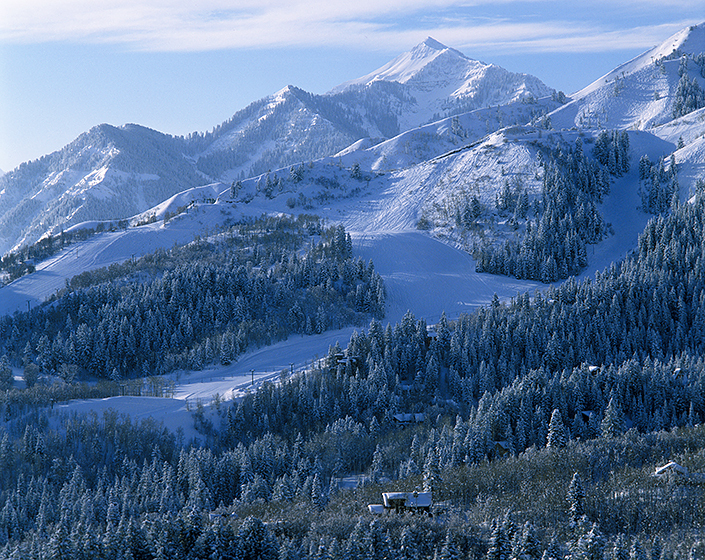 Sundance #12: Like many ski areas, Sundance works to establish summer visitors. The ski lift stays operational to take mountain bikers and tourists to the top of the mountain, and hikers come from all over, to climb the trails in Mt. Timpanogos and visit Timpanogos Caves National Monument. Redford, also offers something very different, an engaging community of the arts. As the first visual artist-in-residence, I join Twyla Tharp, there on a dance residency, and dozens of film makers, playwrights, and screenwriters, who are honing their craft under the tutelage of Redford’s MANY professional friends. Summer days at the resort are busy with their activities, and uninvolved tourists are free to observe while they work. 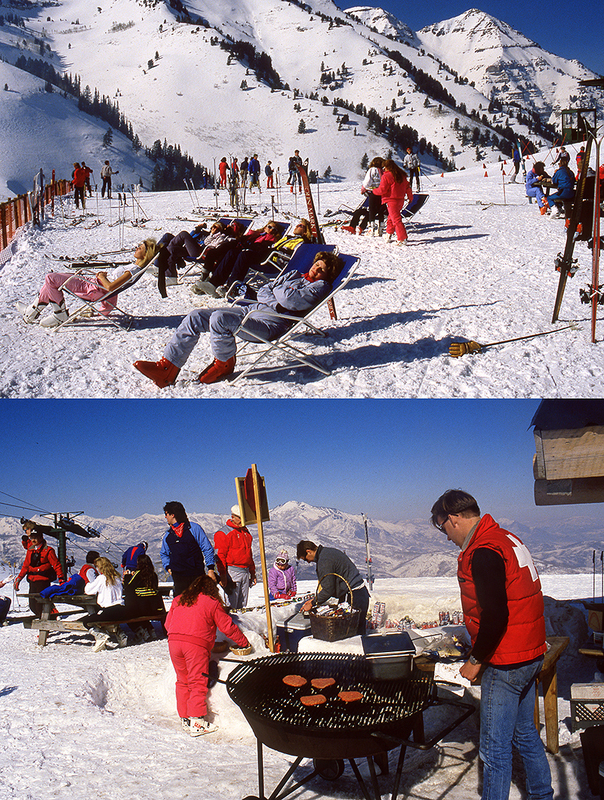 In the upper shot, a film production crew takes a break from their morning efforts to grab some lunch. In the lower shot, tourists and artists alike begin to settle in to the very nice outdoor amphitheater and stage, where on this evening, there will be a concert. Another night it might be a play. As it is too cold to hold these activities in the winter, Redford's most recent idea is to host a small independent film festival during the winter in the cozy, small theater he has added to this compound. Think anyone will come? Sundance #11: As it is becoming a business necessity for ski areas to have summer attractions as well, many of them have started catering to mountain sports such as trail bike-riding, sight-seeing tourists, and hiking, and Sundance is no different. They operate their lifts in the summer to take bike riders to the top of the mountain, and they take tourists there also, to have a look around, and enjoy a lunch at the summit cabin. Redford, however, has introduced another attraction, of which I am now part - the Sundance Institute and the artist residencies. I am the first visual artist-in-residence, but Twyla Tharp precedes me with a dance residency, and numerous screenwriters, and film makers participate too, making summer season a beehive of creative activity. Here you see tourists relaxing in the small complex of buildings and gardens, while they watch a production crew, discuss and review the work they have been doing. Sundance #10: When I discussed being an Artist-In-Residence at Sundance with Robert Redford, I asked what he wanted me to do... if he had a purpose in mind? His response was that he knew of me through my many years of work with the Natural Resources Defense Council trying to stop the destructive and unnecessary logging of the Tongass rainforest, and he felt it surely took a lot of effort. His idea is that I come to Sundance to enjoy its community of artists and athletes, and if I feel like taking pictures, it is not a requirement, but I may shoot whatever I want. He thinks Sundance is beautiful, which I should enjoy, but there is no agenda for whatever work I might do. He simply hopes the environment will inspire me. On my first visit, I am simply trying to get a feel for this landscape, which clearly is, as Redford described - dramatic and beautiful, BUT my environmentally pro-active mind cannot help but notice the building of the huge dam, lake, and 8-lane highway through the Heber Valley, and then there is this (above). The Great Salt Lake basin, is much like the Los Angeles basin, in that it is a low valley floor, surrounded by mountains. Given the amount of traffic and industry present in the Salt Lake basin, a lot of pollution is generated in the form of smog. In the winter, the cold air puts a “cap” on the pollution, trapping it on the valley floor. On bad days, the smog is so thick, it looks like a fog, and obscures everything. I will probably make some images of that as well. Sundance #9: As I would learn from my collective visits, Sundance resort sits in a high basin at the foot of Mt. Timpanogos. That basin is part of the North Fork of the Provo River, which flows through the canyon below. The canyon connects the west side of the Wasatch Range to the east side, and in some places, as you see in post #1, the walls are steep and narrow. The result of this configuration in the landscape is that during windy storms, there is a funnel effect, the canyon can amplify the force of the wind. At other times, it is a sink of extremely cold air, where a lot of vapor is also present, as you see in post #2, the result of which gives you vapor frosted trees and valley fogs. Provo Canyon connects Provo on the west side, to the Heber Valley on the east side, and when you drive through the canyon, beyond the turn-off for Sundance, you eventually come to a broadening valley and a large reservoir. 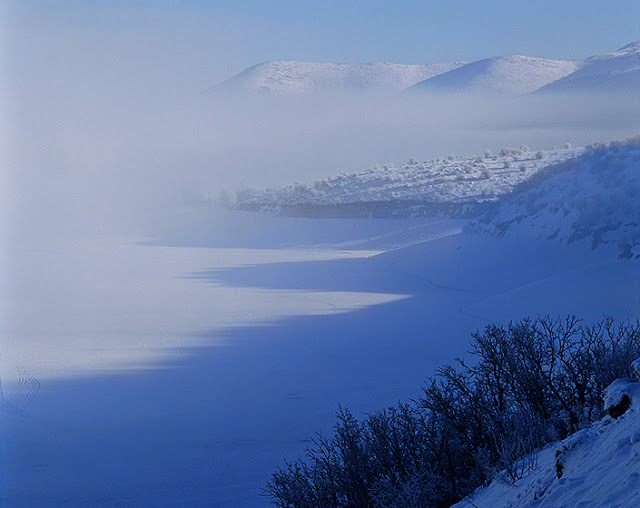 This large body of water also adds to the vapor in the air, and is often “fogged-in.” Beyond this, to the north, lie the resorts of Park City and Deer Valley. At the time of my Sundance residency, construction had just begun on a controversial dam to create and even larger reservoir, that would then be circumvented by a 8-lane super highway, so I will witness some significant change through the years of my visits. Sundance #8: The Sundance resort sits on the east side of the Wasatch Range, in a basin directly below the 11,753ft summit of Mt. Timpanogos. The Wasatch is famous for its dry powder snowstorms that often deliver several feet of snow in a very short time, hence the Utah license plate motto, “The Greatest Snow on Earth.” When those snowfalls happen, the skiing is fantastic, and the surrounding landscape is quite beautiful, but often, those storms are followed by fierce, dry, cold winds. 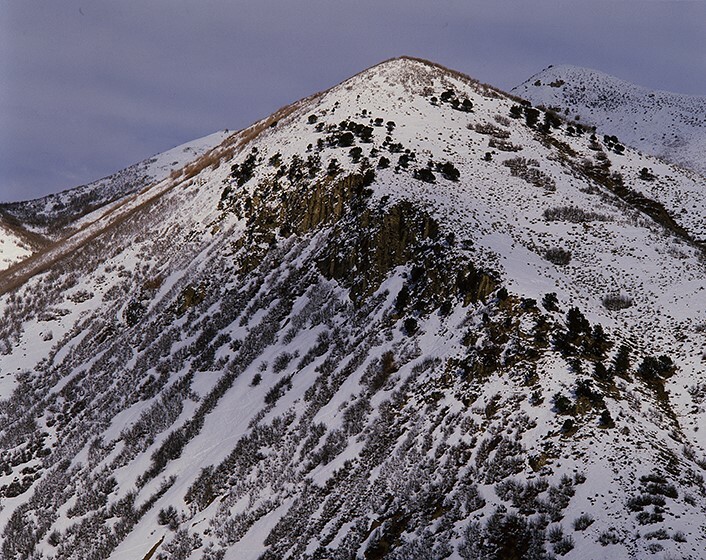 At many of the Wasatch ski resorts, these conditions create avalanche hazards. 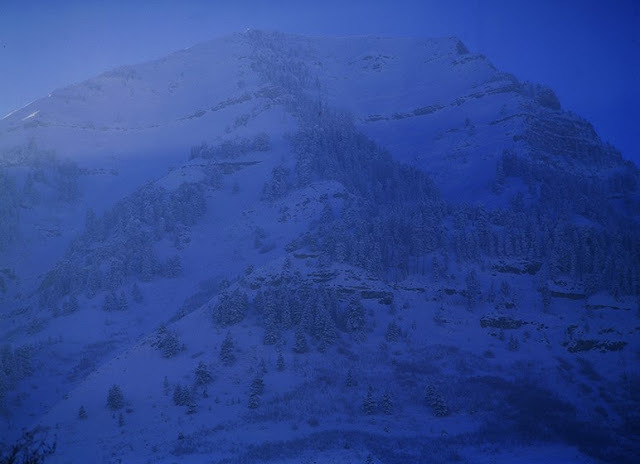 At Sundance, the resort is sheltered by the towering face of “Timp” which puts on a howling show of snow banners and light. On this evening, the winds are gusting through at 60mph. It is about 0˙, and WELL below 0˙ with the wind-chill. The lifts at the resort closed early, and most guests have retired to restaurants and bars to seek refuge. 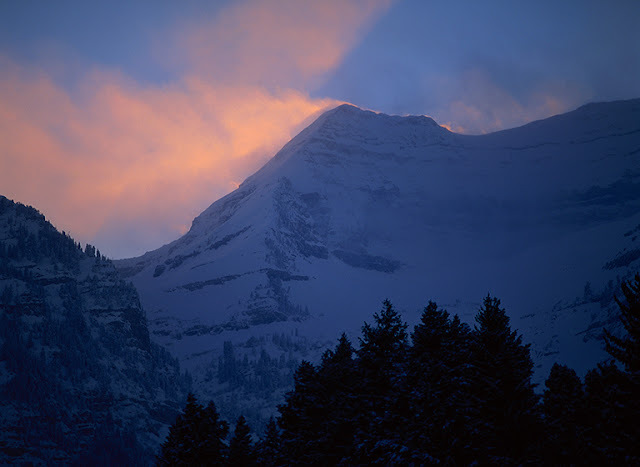 However, as the sun goes down, “Timp” is putting on a show and throwing off spectacular, streaming banners of blowing snow. There are ice crystals blowing in the air, constantly filtering down, and wind gusts create small snow squalls as they sweep trees bare. I am amazed my camera is still working. 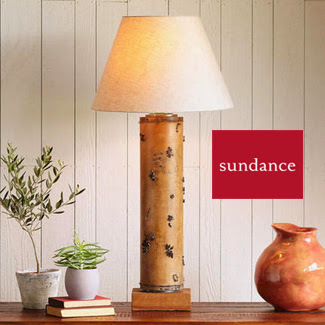 Sundance #7: On my first Artist-in-Residence visit to Sundance, I am invited to stay in the guest cottage on Robert Redford’s ranch. I know that will probably not happen again, so one morning after a big snowfall, I walk the property taking pictures and trying to get a feel for why he chose to live here. The banner picture for this blog is of the ranch road. The last post is Redford’s view to the west, and Mt. Timpanogos. This (above) is the view south and east, taking in the corrals and pastures where he brings his horses in the summer months. During the winter, the horses are moved to valley-level stables nearby, as this high basin is too cold for their comfort, especially when big, blustery storms cycle in the from the west. The resort lies just out-of-sight and to the right in this shot. The Provo River (posts #1-2) lies in the canyon at the foot of that mountain in the distance. 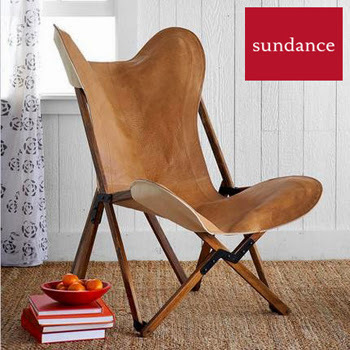 Sundance #6: It is the setting that makes Sundance what it is. The ski area is low-key with limited services, and there is a very limited amount of developable land in the basin, virtually guaranteeing Sundance will remain relatively small. As such, it sits in at the foot of the Mt. 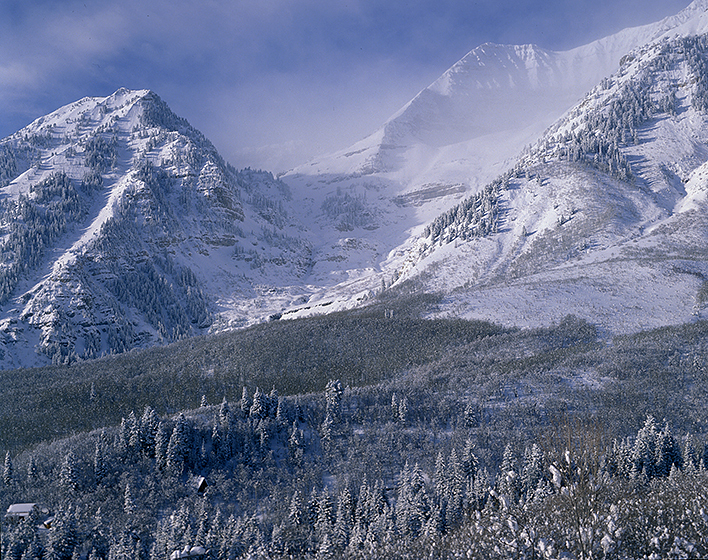 Timpanogos Wilderness and looks directly up at the 11,753ft summit. “Timp” is not only dramatic, but because of its size, it is a weather-maker in all seasons - thunderstorms in the summer, powder storms, and high winds in the winter. The resort, cottages, and homes for the most part, are built on one side of the valley basin, then on the opposite side and further up the road, above the resort, lie a few more homes, and Redford’s ranch. This is his view from that property, and “Timp” is generating it’s own haze cloud as extremely cold air circulates around it. Actually, this is the view from the Redford Ranch guest house, where I am invited to stay on my first visit. 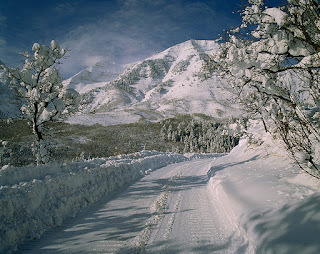 The picture that is the banner for this blog, is the road into the property after a good snowfall the night before. Do I ski, or do I shoot? Sundance #5: At the time of my Artist-In-Residence at Robert Redford’s Sundance, the “resort” and cottages are new, but the ski area has long been a favorite of locals, and the college students from BYU in nearby, Provo. There are an increasing number of services at the base of the ski mountain, but there is only one small hut at the top of the lift, and nothing in between. The hut is like a clubhouse on a good ski day. It is small, so it fills quickly, and the demand for food is greater than the kitchen can supply, so if the weather is nice, they take food outside and grill. Everybody, suns, drinks, and parties. Over the several years of my visits, I will enjoy the summit hut in several ways. I will camp in it overnight for a spectacular dusk-to-dawn shoot. I will also arrive at the hut early one morning after a DEEP POWDER storm, to find the bar scene from Star Wars, waiting for the ski patrol to open the slopes so they could all jump into the bottomless white. Some skiers actually had snorkels! Sundance #4: Reversing the view from the previous post takes in the entire basin occupied by the Sundance ski area, cottages, and private homes. It is a small, “family-style,” ski resort that Redford has purchased, and he is adding a few small buildings around the base area. The true magnificence of the setting, however, is Mt. Timpanogos, the tall, broad peak on the skyline to the left in this picture. Scale is difficult to read here, you can barely see all the skiers standing at the base ski lift on the right. So the actual face of “Timp” is far more impressive from other locations, as you will eventually discover in this blog. For the moment I am just trying to orient you to the area. The ski slopes run up to the left. Redford’s home/ranch is out-of-frame to the right, and those tan colored structures that stand out on the hillside, are REALLY nice log “cottages” the resort has built for guests. I will stay in those on most of my visits. The other new structures that have been added include the dance/concert auditorium (where Twyla Tharp is summer Artist-In-Residence), and a very nice small theater, where Redford is thinking about having an intimate film festival. WHAT???? 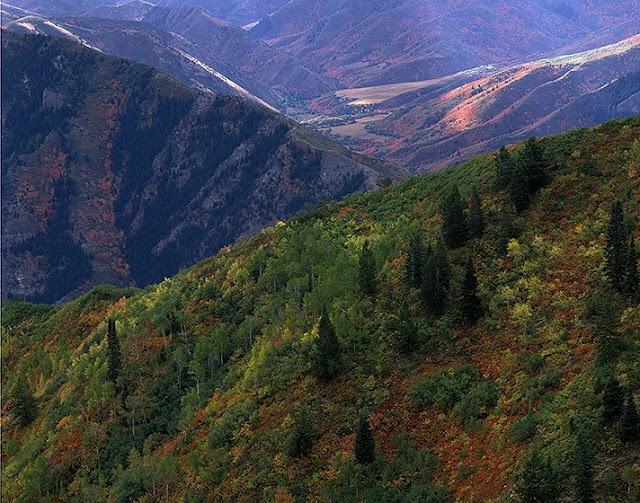 Sundance #3: The highway from Provo, through the Provo Canyon, will ultimately take you to the town of Heber City, and on beyond to Deer Valley and Park City. Sundance is one of the most southern ski areas in the Wasatch Range, however, and about half way to Heber, the narrow, steep North Fork canyon road ascends to the west, rising to the Sundance ski area, which sits in a high basin at the foot of Mount Timpanogos. Sundance is small by ski area standards. It was previously a family operation, primarily visited by locals and college students from the Brigham Young University in Provo. 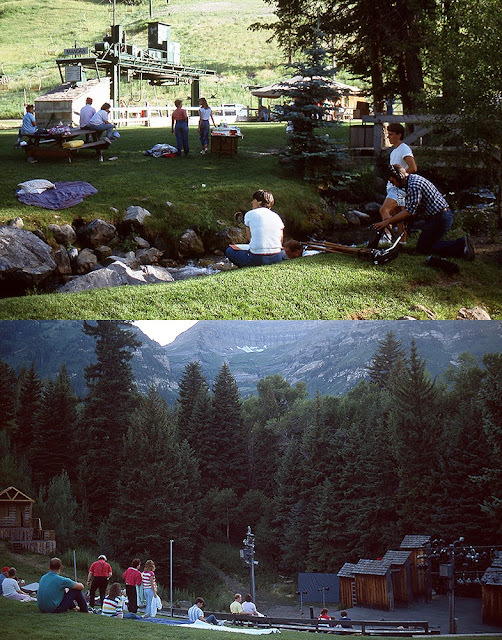 A true mom-and-pop operation when Redford (and crew) arrived to shoot the movie, “Jeremiah Johnson.” Redford told me that during that filming, he fell in love with the beauty of Sundance and the surrounding area, so he bought a small ranch,..and then he bought the ski resort. Since then, some homes have been built, some guest lodges have been added, and the main resort has a nice small movie theater, a concert/dance hall, some stores, and a great restaurant. To be clear about scale, and resort size, in this image, the structures you see are private homes. The ski area comes in from top-right, and descends to the left. THAT IS THE ENTIRE SKI AREA! The mountain in the background is NOT part of the resort, and in fact, is on the other side of Provo Canyon. Sundance #2: After hanging up on Robert Redford the first time he calls me, I do finally believe it is actually him when he calls back. Certainly I am surprised to receive the call, since I do not know him, but I am even more surprised that he is asking if I would like to be the Sundance Institute’s first visual Artist-In-Resdence. I am honored to be asked, and VERY interested, but I am also working on a huge book project and numerous magazines stories, and I worry that I cannot be “in-residence” appropriately, for any substantial length of time. As the other artist residencies occur during the summer months, Robert suggests mine could spread over several years, and that way I would have the opportunity to see all four seasons, coming and going, as I have the opportunity. That seems to work for me, so I propose to come for the first time during the approaching winter season, and Robert explains that as part of the residency, Sundance will provide meals and housing, and he wants me to stay at the guesthouse on his ranch my first visit. To get to Sundance, you fly into Salt Lake City, drive south to Provo, and then follow Provo Canyon into the Wasatch Range. The canyon is dramatic, growing ever-narrower beneath towering walls as it proceeds (last post). 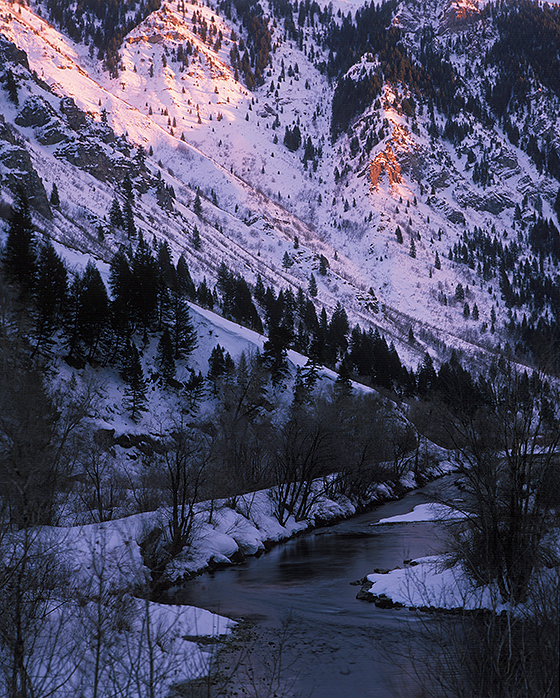 Considered one of the great fly-fishing streams in America, the Provo River meanders next to the road, and in winter, the canyon does not see much sunlight so it gets VERY cold. 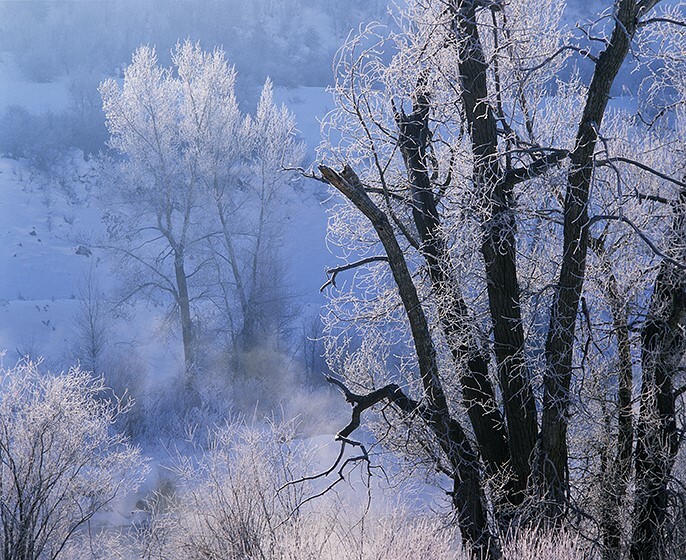 The air, being much colder than the flowing river, crystallizes water vapor steaming off the river, and bedecks the trees and shrubs immediately around the river with a dazzling frost display on a regular basis. Sundance #1: In the late summer of 1987, I am very busily working in my studio on numerous stories and projects when the phone rings. The voice tells me, he is Robert Redford. I have never met him, and certainly have no reason to believe the actual Robert Redford would be calling me, so thinking it is a friend pranking me, I simply say, “Sure you are,” and hang up. Some minutes pass and the phone rings again. This time the voice says, “Before you hang up, we have a mutual friend, Eelco Wolf.” Eelco Wolf was a friend, a collector, and a significant representative of Polaroid, so mentioning him gets my attention. “Did I just hang up on Robert Redford? ", I ask, which he affirms. The next question is then, “Why are you calling me?” Robert does a lot of work on behalf of the Natural Resources Defense Council (NRDC), with whom I work on the Tongass campaign, so he is aware of the effort I am putting into that, and he suggests I might enjoy “a place to retreat.” He has purchased a small, local ski resort outside of Provo, UT and he has now created a foundation and the Sundance Institute, dedicated to the arts, and in particular film. There have been some writers, filmmakers, and dancers, he has invited to the institute for a residency, but not yet a visual artist, and he wonders if I would like to be the first. What do you think?